Weddings are a really, really big deal for some people, just ask Priyanka Chopra and Nick Jonas, who went all out for theirs. People, like this bride, sometimes go a bit overboard and start coming up with some rules that are, well, unconventional to say the least. 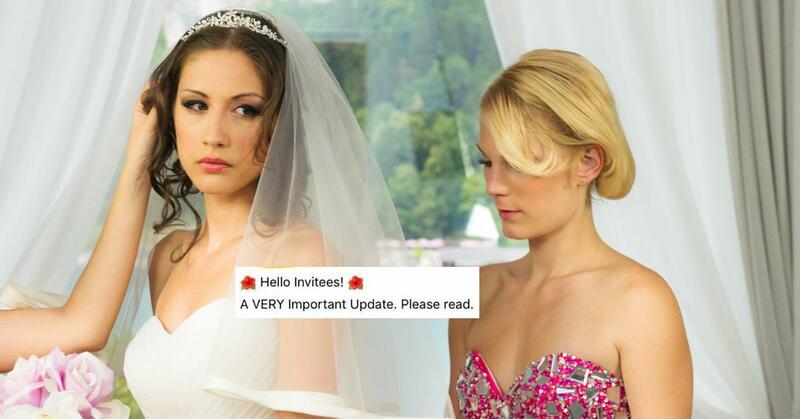 An unnamed woman crafted some very specific clothing rules for her destination wedding in Hawaii. 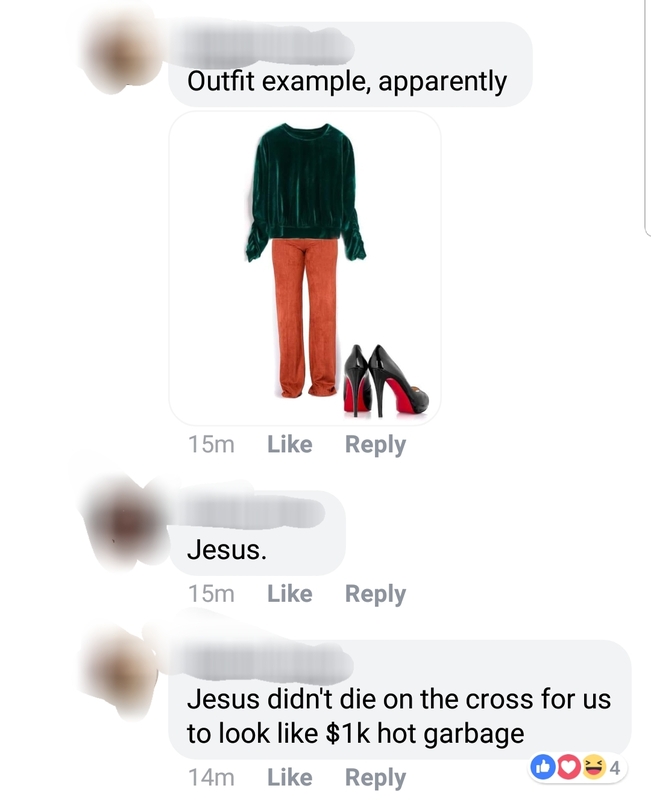 Clothing rules that her guests found so absurd, that someone decided to snap a photo of it and share all of them with reddit. 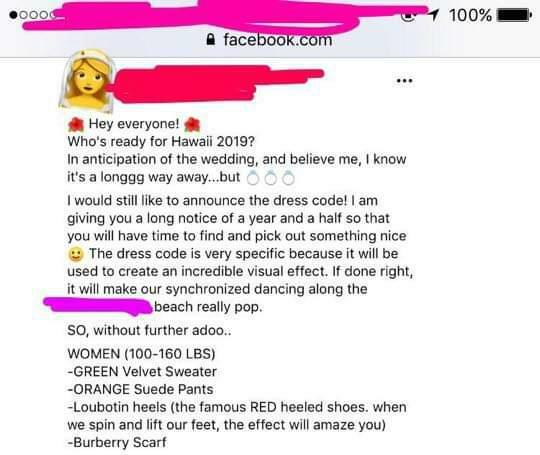 I don't know what's worse: the fact that the she posted the rules a full 18 months before the wedding, that the clothing choices sound absolutely abysmal, that she wanted her guests to drop at least $1,000 on their outfit, or that she indicated that a guest's weight decided what color scheme they were allowed to wear. If all of that was too difficult you to read, then allow me to give you the shortened version. For this woman's destination wedding in Hawaii she's asking that all of her guests dress a specific way in order to ensure that the synchronized dancing looks on fleek. 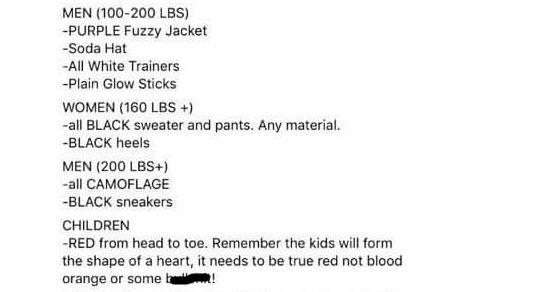 She wants women between 100-160 pounds to wear green velvet sweaters and orange suede pants, and red Louboutin heels (I know, right?) along with a Burberry scarf. I'm no fashion expert, but that sounds like a downright disgusting outfit to wear. Even her guests thought so too. 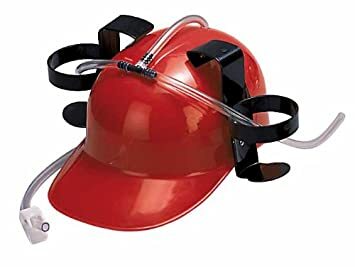 Men under 200 pounds were expected to walk around looking like the Grimace, (I wouldn't even know where to find a purple fuzzy jacket), wear a soda hat (does she mean one of these?) white sneakers, and "plain" glow sticks. I didn't know glow sticks came in plain and special varieties. Oh and if you are a women who weighs more than 160 pounds, well then she wants you to dress in all black sweaters, from your heels to your sweater and pants. Dudes over 200 pounds? Camouflage and black sneakers. 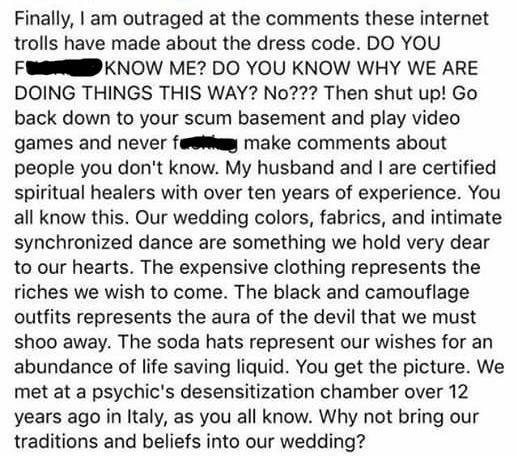 I'm just going to say it: this wedding dress code sounds like it was created by a complete psychopath. 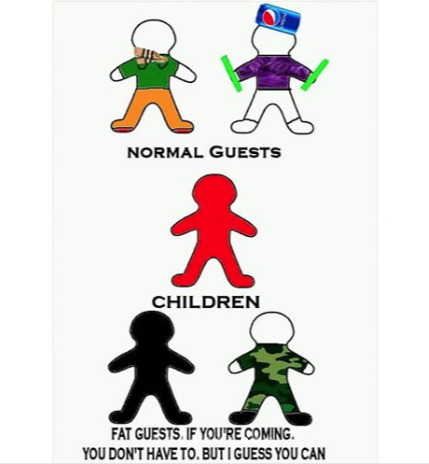 What's worse is that if you were planning on bringing children to the wedding, you are expected to dress them from head to toe in red. Not reddish, not a shade of red, but "true" red, whatever that means, or so help her God. All because she wants to use them to form the shape of a heart. Let us, for a minute, toss the terrible color schemes and clothing choices out of the window: the wedding is taking place in Hawaii. On a beach. And she's asking all of her guests to dress in sweatpants and asking women to wear heels on the sand. Just picture that and try telling me with a straight face it isn't just about the worst idea you've ever heard in your entire life. 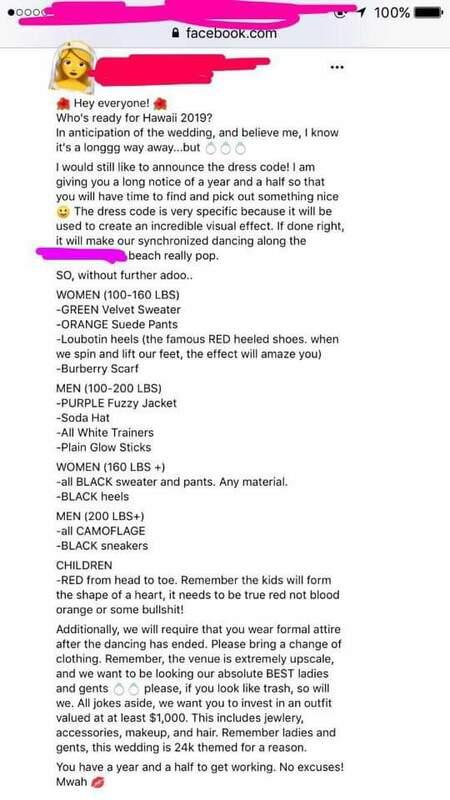 It didn't take long for her batpoop-insane demands to surface online, with a myriad of people commenting on just how wacky one would have to be to not only devise such a demanding list of clothing stipulations, but to actually expect people would adhere to it willingly. 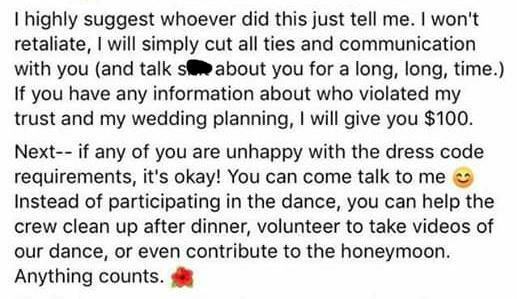 Once word got out that her ridiculous demands went viral, the bride-to-be utilized used it as a moment of self-reflection and really thought about why people took such offense to her demands. 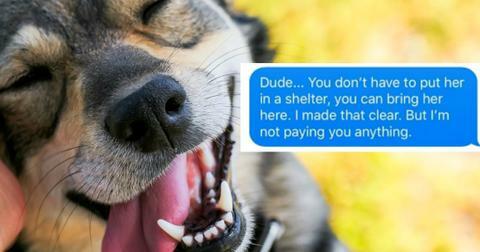 She then responded in a totally calm and reasonable matter, opening her eyes to the error of her ways and realizing that she was being utterly self-absorbed, deluded, and borderline crazy. LOL just kidding she doubled down on the wackiness. 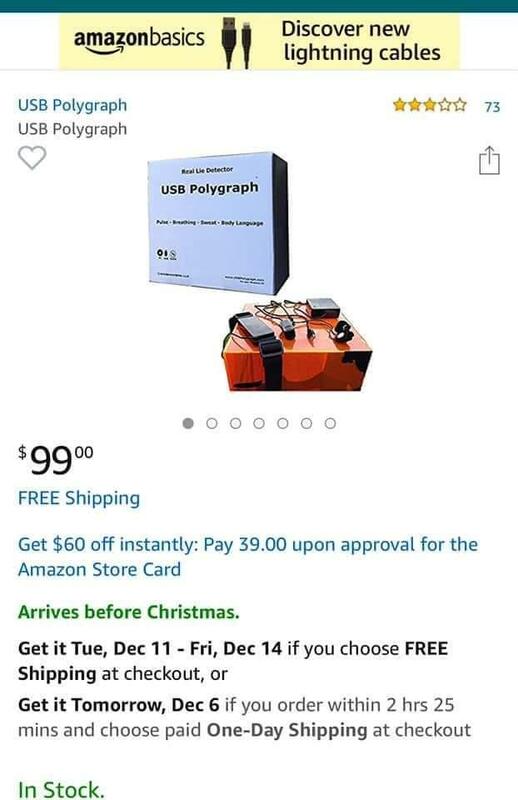 Turns out that she decided to retaliate against her friends group by purchasing a $99 polygraph test machine off Amazon. 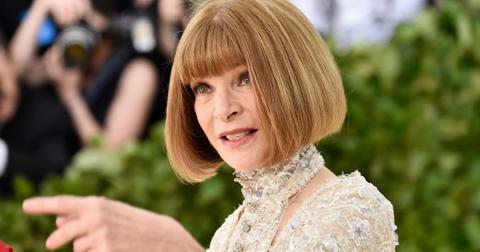 If you weren't the type of person to ask their guests to dress like an Oompa Loompa in $700 heels, then you'd know that there's no way you'd be able to buy a lie detector for the same amount of money as a Boost Mobile Android phone that has an affinity for shooting its battery across the room every time you drop it on the floor. 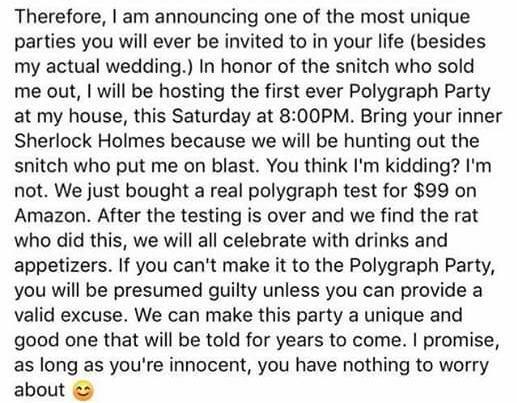 But since she is, not only did she think the machine was a smart purchase, but that she'd throw a party to find the "rat" that posted her weird wedding dress code requests online and people would actually show up. 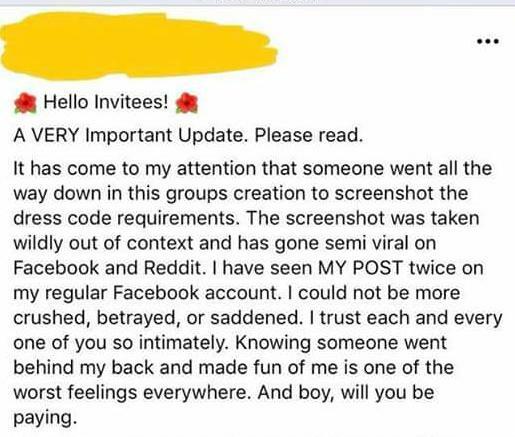 She thought she'd entice guests with appetizers and drinks and if they didn't show up, she'd just assume you somehow were a part of this grand scheme to humiliate her online. Let's forget the fact that even the most advanced polygraph tests don't work. 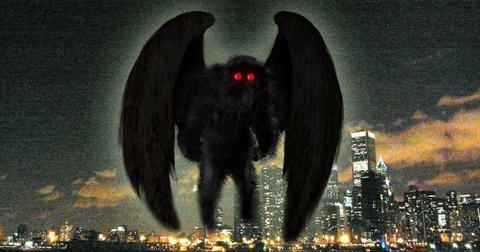 They're primarily used for theatrical purposes to get people to admit to things they'd otherwise deny. But even if they did, and the one she brought from Amazon was 100 percent fool-proof, why would she be embarrassed by her demands if she thinks they're totally reasonable? She has to know how absolutely, gobsmackingly mad she is. She also had some choice words for all of her critics online. While her profanity-laced rant is filled with a lot of gems that could only be uttered from an individual who has lived in a carefully constructed fantasy for themselves — an unhealthy one I might add, one claim stands out above the rest. And it's that her ceremony complete with red-bottoms, soda hats, and crazy purple fuzzy sweaters on a beach in Hawaii are all apart of some type of religious or cultural ceremony. Any critique of this ceremony would be considered highly insensitive and yes, that includes the soda hats and camouflage clothing meant to "hide" them from the devil. 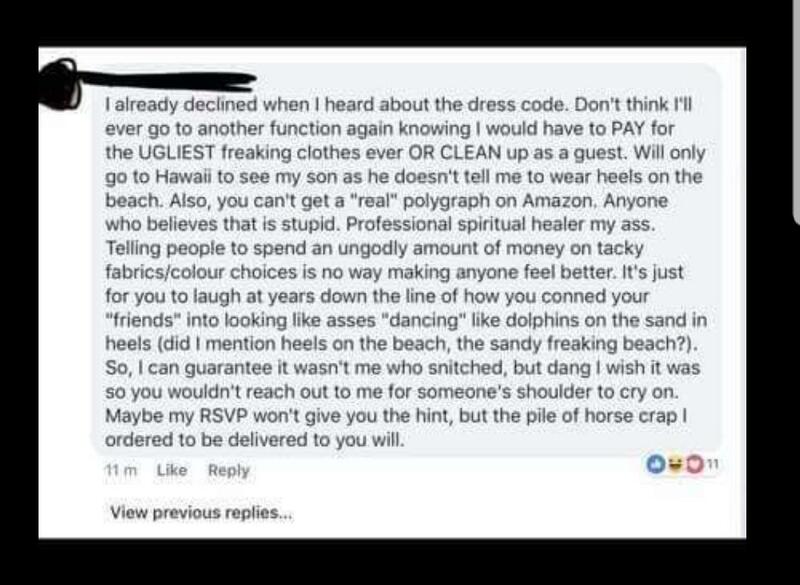 One of the guests responded to the original post on Facebook, basically letting this spiritual healer know that they're out of their mind and that they had already declined to join the invitation the second she sent out the insane dress code. If you want a few laughs, then check out the comments section on Reddit. It's comforting to know that such insanity is hardly viewed as acceptable. 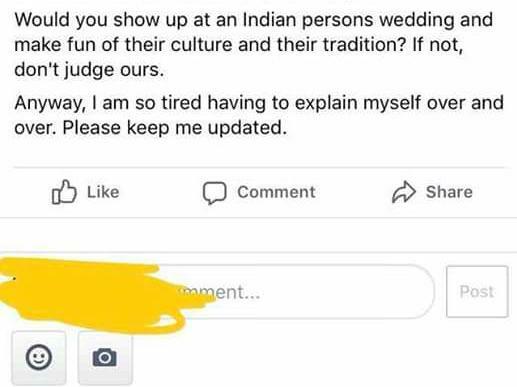 And while being judgmental of complete strangers online is oftentimes mean, I think it's safe to say that this bridezilla provided all of the information necessary for everyone to pass judgment.